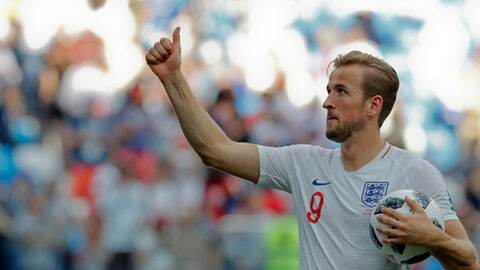 VOLGOGRAD, Russia (AP) England’s 6-1 rout of Panama is the biggest winning margin at this year’s World Cup. However, it falls well short of the tournament record. Hungary scored the most goals in a single World Cup match when it became the first and only team to put in 10. The huge victory over El Salvador came in their opening group match at the 1982 tournament in Spain. Substitute Laszlo Kiss scored a seven-minute hat trick. Hungary still failed to progress to the next round, however, after losing to Argentina and drawing with Belgium. El Salvador, which has lost all six matches it has played in at two World Cups, hasn’t qualified since. Zaire was the first sub-Saharan African team to play in the World Cup in 1974. But after a fairly solid start, losing 2-0 to Scotland, Zaire was routed by Yugoslavia 9-0 with six of the goals coming in the first half. Dusan Bajevic scored a hat trick. In its next match, Zaire lost only 3-0 to Brazil. Zaire, now called Congo, has not been at a World Cup since. Sweden’s first match of the 1938 World Cup in France came in the quarterfinals, and it was a blowout. Cuba had gotten past Romania in the first round of the knockout tournament but only after a replay. Three days later it met Sweden, which had been granted a bye into the quarterfinals as a result of Austria’s decision to pull out of the tournament after it joined up with Adolf Hitler’s Germany. It’s a game Cuba would probably rather forget. Gustav Wetterstrom and Harry Andersson both scored hat tricks as Sweden won 8-0. Sweden was then on the other end of a rout in the semifinals, losing to Hungary 5-1. Uruguay pulled off its own 8-0 victory in 1950 against Bolivia. Oscar Miguez scored a hat trick. For Bolivia, there was some consolation because Uruguay ended up winning the title after beating Brazil 2-1 in the final match of the tournament. Another 8-0 result came at the 2002 tournament, when Germany got a hat trick from Miroslav Klose in the victory. Saudi Arabia was eliminated from the group stage with zero goals scored and 12 conceded, while Germany went on to reach the final and lose to Brazil.